Richard Branson has written several variations on the theme of “A company’s employees are its greatest assets” because he understands that people are the most important link between a retail business and a customer. No matter the advertisement, sale price, or the convenience for a particular item or service, it is most often the personal interaction that seals a retail transaction, retains a customer, and fosters the repetition of that process. 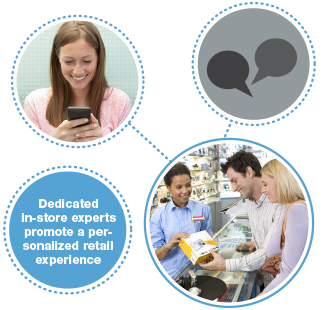 Just who is an in-store expert? What sets them apart as an employee? Why are these in-store experts a company’s “greatest asset?” How is the expertise displayed to the customer? In-store experts in an Apple store are dedicated, helpful, and have been trained to use and apply the products to their customer’s needs. This is a powerful combination of skills that is promoted by Apple as a defining, and distinguishing difference from its competitors. When one has a question or a problem with an Apple product, it is sure to be solved by one of their in-store experts. Regardless of the industry, the best in-store expert possesses excellent product knowledge and understanding of how customers can make best use of the products and services sold in their store. Also known as “The Engagement Ring Store,” Robbins Brothers understands that they must project the experience and knowledge of their in-store experts when visitors first start to research their products. With the vast majority of retail transactions beginning with an on-line search, Robbins Brothers makes sure that their in-store experts are prominently displayed on their store’s web pages when visitors research the store that they plan to visit. This localizes, and personalizes the shopping experience. Now a visitor has a name and a face ahead of a store visit. Trusted, experienced, team members, are introduced on the website with a picture and a biography along with along with store specific information such as the store address, hours, and product offerings. Robbins Brothers effectively accomplishes this using Climb Technology’s Stores4Stores web-based application. Easily deployed, and adaptable, Stores4Stores microsites allow a retail establishment to project the individuality of its local stores within a defined corporate framework. Not only are the products highlighted, but the in-store experts. A quick way to see all of this technology in action, even more features, and peer behind the scenes at the administration functions is to contact Climb Technology via the web, e-mail, or phone. We’re happy to provide a demonstration of how Stores4Stores will fit into your on-line initiatives.